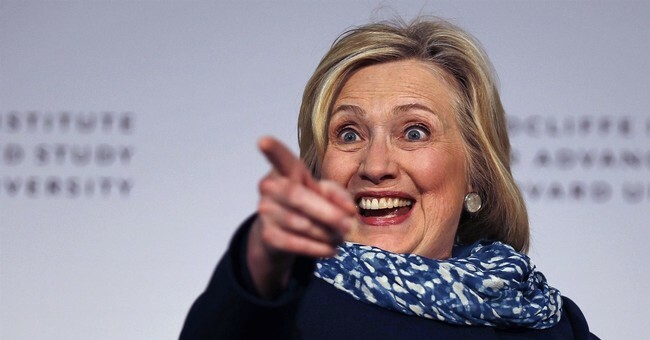 Not long ago, I told a group of friends, all liberal Dems, that I believed she was keeping open the possibility of a rematch against Trump, and might already have decided to run. It was unanimous — they were horrified. “I would not give her a single cent,” one man, formerly a big donor to Clinton, said emphatically. Their reasons are no surprise: Her moment has passed, she was a terrible candidate and her endless claims of victimhood are tiring rather than inspiring. It’s time to find new blood. Here’s how I believe she sees the playing field, and why she can’t be ignored. First, because there’s no clear front-runner for the nomination 18 months into Trump’s presidency, Clinton remains the closest thing to an incumbent. She’s also got numerous advantages, from name recognition to campaign experience to an off-the-shelf cabinet, that could give her a head start. Second, a crowded, diverse field diminishes the chances of anyone knocking her off. Recall how Trump outlasted 16 GOP rivals by having a committed core of supporters that grew as the field shrank. Clinton could be in a similar position — unpopular among many, but also unbeatable by a single opponent. Third, looking ahead to the 2020 primaries, she sees no reason to fear the favorite daughters and sons in key blue states. She would almost certainly beat Sen. Kamala Harris in California, Sen. Cory Booker in New Jersey and Gov. Andrew Cuomo in New York. And please — forget Sanders and Joe Biden. Sanders is already 76 and Biden, at 75, has never been a viable candidate for president and still isn’t. Fourth, money is not an issue. Some donors will resist Clinton at first, but any Dem nominee can count on all the money in the world to run against Trump. A new Vox Pop Poll finds that 52 percent of Democrats would consider voting for Hillary in 2020. That put her ahead of second-tier candidates like Sen. Kamala Harris (CA) and Sen. Cory Booker (NJ), but behind the big names like former Vice President Joe Biden, and Senators Bernie Sanders (I-VT) and Elizabeth Warren (MA). The most interesting number in the poll, however, is 35. That’s the percentage of Democratic primary voters who say they wouldn’t consider supporting Hillary–twice as high as any other major candidate. And then there’s the New Hampshire problem. It’s very unusual for a presidential candidate to lose a state they’ve previously won. Hillary beat Barack Obama in the Granite State in 2008, but then lost–badly and embarrassingly–to the (then) renegade candidacy of Bernie Sanders. The most famous Democrat in America got less than 38 percent of the vote against a socialist in a state she’d previously won. To put that in perspective, Pat Buchanan got a higher share of the GOP vote against a sitting president than Hillary Clinton got against a Larry David lookalike. The trendlines appear to be going the wrong way for Hillary Clinton. She’s rarely mentioned by the Democrats running to replace Rep. Carol Shea-Porter in the First Congressional District–many of whom were proud Sanders’ supporters. Well, she had the establishment, money, fame, and money in 2016—and lost. Yes, I hear the three million more popular votes that Trump. It must be nice that the most populous state in the country is deep blue, left wing, and totally insane. Of course, California is going to give Democrats that edge and when they lose the real contest—the Electoral College—they’re going to harp on it as if it means something. Sorry, it doesn’t. Trump won more electoral votes and in this case, more states than Hillary. She’s a loser. Yet, even with her 2016 loss, her amazing flaws as a candidate, her abysmal approval ratings(lower than Trump’s), and her poor performance on character questions, I agree that she would wipe the floor with the 2020 field. It will also energize the 2020 GOP base like no other. Wait—wouldn’t Hillary get Democrats excited? I’m betting not so much. It might literally end as a repeat of 2016. A large slice of the party, the progressive wing, does not trust or like Hillary. They saw what happened in 2016. With Trump and Hillary at the top of this hypothetical 2020 ballot, they might just sit out. The GOP will be united behind Trump, while the Democrats will bicker and fight over a third Hillary nomination. Messaging is more important than money—and the 2016 Clinton crew failed miserably. She will not do well with rural white voters, whom she lost to the Donald Trump by a three-to-one margin. If it had been two-to-one, she would be president. But after the deplorables remark and the utter lack of cohesion on an economic message that resonated with these people, it’s safe the white working class is not going to just drop support for Trump and flock to her. I’ll assume that minority voters in key counties, like Wayne in Michigan, unenthused again will sit 2020 out. Also, Trump has a record—and it’s a good one. Three million new jobs created, consumer confidence at years-long high, along with small business confidence, the Dow Jones experience the largest annual gain ever under the Trump administration, we could be nearing a nuclear agreement with North Korea, and he’s about to add two judges to the U.S. Supreme Court. If he gets the money for the border wall, the base will return the favor for sure. So, please—Hillary, by all means run and lose again. There are far more issues with her uniting the Democrats than Trump has with the Republicans. She’ll fill the GOP’s war chests. She’ll remind even the most ardent Trump skeptic that he’s infinity better than her. He’s governed more conservatively, maybe those who decided to sit out or cast a ballot for someone else might come home to the GOP in two years. Our side will be hyper-energized. The Democrats will be excited yes—but again it might not be enough to win. Let’s also not forget that she was dead wrong about Trump and his effect on the economy. We hit 25,000 again on the Dow Jones last Friday. Jobs reports are strong. There is no recession. Hillary Clinton was wrong--shocker.